Issuing Company: Telfer Biscuit Co.
Card Size: 2" x 3 1/4"
Notes: Checklist Incomplete. The backs state that there are 5 cards from each of 24 different films, for a total of 120 cards in the set. For the card numbering, each film apparently had a letter assigned to it, followed by a dash, then a number 1 to 5. I checked the dates for the two movies I've seen so far on these cards and both were released in 1923, so I am placing a 1923 date on this set. 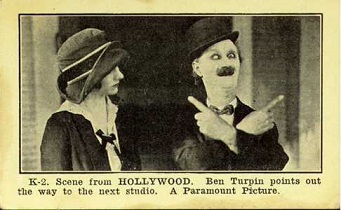 The backs also note that customers were able to mail in for a large, hand-colored picture of the star of a particular movie. I haven't seen one of these large pictures. If anyone has one, email me a scan so it can be included on the site for all to see. A-2. Scene from The Covered Wagon. Starring Lois Wilson and J. Warren Kerrigan. B-1. Scene from Soft Boiled. Starring Tom Mix. A Fox Production. C-2. Scene from The Light That Failed. Starring Jacqueline Logan. A Paramount Picture. C-5. Scene from The Light That Failed. Starring Jacqueline Logan. A Paramount Picture. F-1. Scene from A Man From Home. Starring Anna Q. Nilsson. A Paramount Picture. H-5. Scene from Monna Vanna. Starring Lee Parry. A Fox Production. I-2. Scene from Potash and Perlmutter. Starring Barney Bernard and Alexander Carr. A First National Production. K-2. Scene from Hollywood. Ben Turpin points out the way to the next studio. A Paramount Picture. L-3. Scene from Trilby. Starring Andree Lafayette and Arthur Edmund Carew. A First National Production. N-2. Scene from The Eleventh Hour. Starring Shirley Mason. A Fox Production. O-3. Scene from Stephen Steps Out. Starring Douglas Fairbanks, Jr. and Theodore Roberts. A Paramount Picture. O-4. Scene from Stephen Steps Out. Starring Douglas Fairbanks, Jr. and Theodore Roberts. A Paramount Picture. O-5. Scene from Stephen Steps Out. Starring Douglas Fairbanks, Jr. and Theodore Roberts. A Paramount Picture. R-4. Scene from If Winter Comes. Starring Percy Marmont and Ann Forest. A Fox Production. S-1. Scene from Penrod. Starring Wesley Barry. A Marshall Neiilan Production. T-2. Scene from The Spanish Dancer. Starring Pola Negri. A Paramount Picture. U-1. Scene from The Silent Command. Starring Martha Mansfield. A Fox Production. W-2. Scene from Robinson Crusoe. Starring Harry Meyers. A Universal Production.